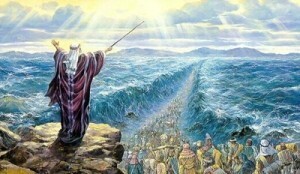 As we have seen throughout the story of Exodus, the Israelites are stuck. Stuck in part from their circumstances of slavery and partly stuck because of fear. How so? Consider their choice in living a life of slavery, making bricks for an oppressive ruler over a life of freedom. This choice often led them to death. As we read through Exodus 14, we see that they finally choose differently. They choose freedom. The result? They become trapped; hemmed in by the Red Sea in front of them and the entire Egyptian army not far behind. Not only that, the Egyptians were on horses and in chariots, brandishing spears, arrows, sharp swords and all other life removing apparatuses. They could feel their impending slaughter. It would be easy. The rest of the story is obvious. God steps up in a way that nobody else could, performing the life-saving and mind-blowing miracle of dividing the Red Sea. This act enables the Israelites to walk to freedom on dry ground. Now, if you are like me, you will give a quick shout out for the Israelites and a fist pump for an awesome victory. But… it doesn’t really impact my life today. Or does it? This is precisely where our journey collides with the Israelites.